The much awaited results of The Voice Kids live semi-finals is almost here. 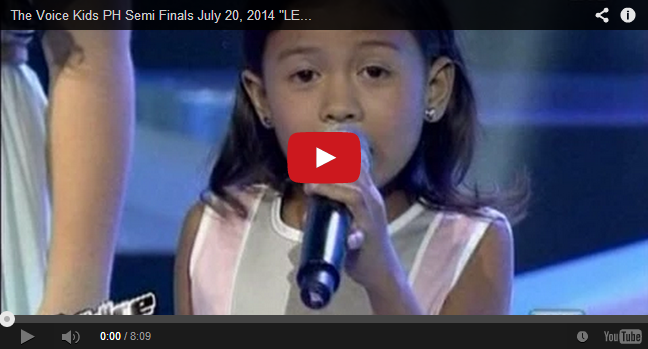 Darlene, Lyca and Edray Sings 'Let It Go' Sings 'Let It Go' on The Voice Kids PH Live Semi-Finals July 20, 2014 at at the Resorts World Manila, Pasay City on Newport Performing Arts, Theater. The six talented young artists performed on the stage to show that they are capable of surviving the competition up to the finals. Six of them have competed and there is only a need to know who among them will remain and advance to the finals. Now, after a through deliberation and tabulation of number of text messages saving each young artist, the results are here. Text VOICE <name of the kid> and send to 2331 for ABS-CBN Mobile, Globe, TM and Sun Cellular subscribers and 231 for Smart and Talk 'N Text subscribers. P1.00/vote is charged for ABS-CBN Mobile, P2.50/vote for Globe, TM, Smart and Talk 'N text and P2.00/vote for Sun Cellular subscribers. Another way of availing votes is by means of registering. This is done in a very easy step: TEXT VOICEREG Name of artist name/age/gender/address and send to 2331 for ABS-CBN Mobile, Globe, TM and Sun Cellular subscribers and 231 for Smart and Talk 'N Text subscribers.